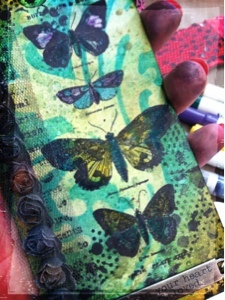 I finished my stamped image with some Distress Markers for quick details on the butterflies and inked up some floral ribbon with Distress Stains to finish it off. I'm loving the Spring Seasonal Distress- it's my palette for this tag, with the addition of some Brushed Corduroy Distress! I used the "faded layers" technique as it's written in A Compendium of Curiosities, Vol. 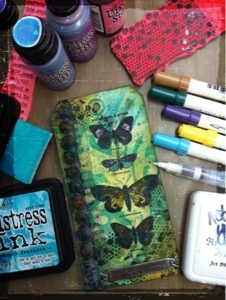 2 by Tim Holtz... Adding a few tweaks here and there :). Lots of great tutorials in the book! Very Pretty...looks like your work well under pressure. Actually I find that is when I do some of my best work. Thank your for sharing! Love it Tara. What a great tag. Jen. You DO work well under pressure! 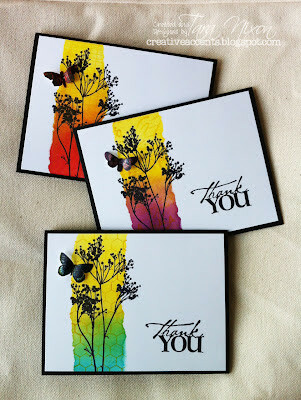 This is gorgeous, Tara-- the colors, the design, and the elegant work you did with the Faded Layers technique. Bravo-- and well done!! !